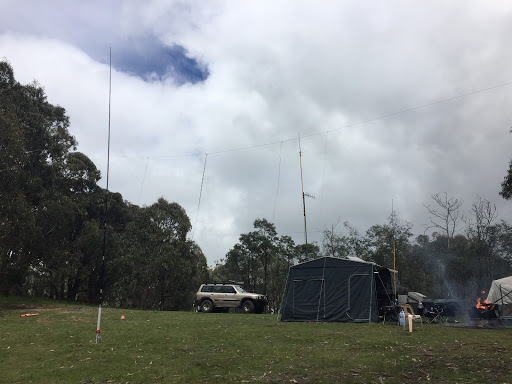 Mafeking Rover Park will soon have it’s own Radio tower to service site and amateur radio operations. Stay tuned for more information as the project develops. The Sturba antenna was a success, adding about +3 signal to that received on the squid pole during the JOTA 2017 operation. The antenna was lifted to 3m above ground from the bottom of the array, sitting approximately 8m high. The thick wire just offset to the left of the centre below is the 450Ω feedline, attached to a balun on the ground and RG213 to the HF rig (a Yaesu FT-450). To construct and explore the benefits of a Sturba Antenna Array.